Driving a Police Car is serious business, there are certain safety precautions that you must take to protect yourself. The number one task to ensure your safety is to know your surroundings at all times. Tadi Brothers is prepared to equip you with everything you need to see the world behind you when on your Police Car with this Police Car Camera Backup System. The Police Camera Backup System also comes with a 170° waterproof camera. This size of viewable angle allows for everything behind you to be clearly seen - even when you’re riding into the wee hours of the night. The camera also withstands any harsh weather you put it through. Use the included brackets to angle the camera to your specific preference. 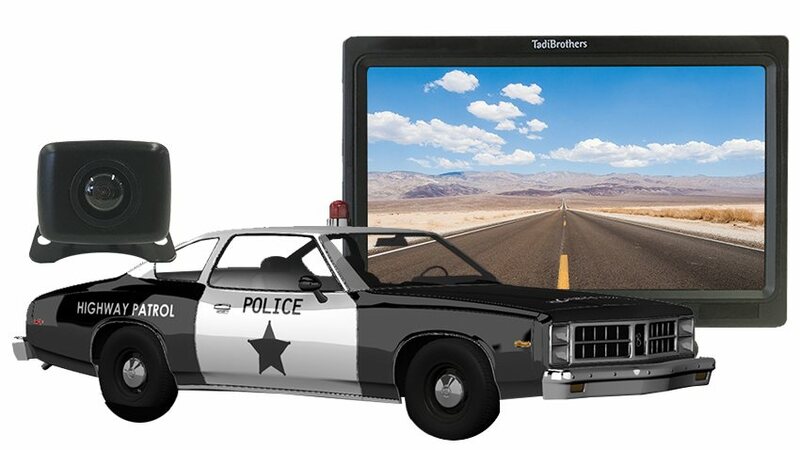 This combination camera and monitor kit includes a larger screen for Police Cars than some of our smaller versions. The larger screen still includes the same exceptional features of our smaller models such as rich colored images, thin, lightweight design, and compatibility with DVD players and gaming consoles. The monitor is easily secured with industrial velcro and you are able to remove it at anytime. Each image you view on our 4.3” model is crystal clear with stunningly sharp resolution. Keep yourself protected today by viewing everything that is behind you throughout your entire ride. Stay protected when you invest in a backup system from Tadi Brothers. Our top priority is to keep you safe and at ease at all times when traveling. We guarantee you will love our cameras!